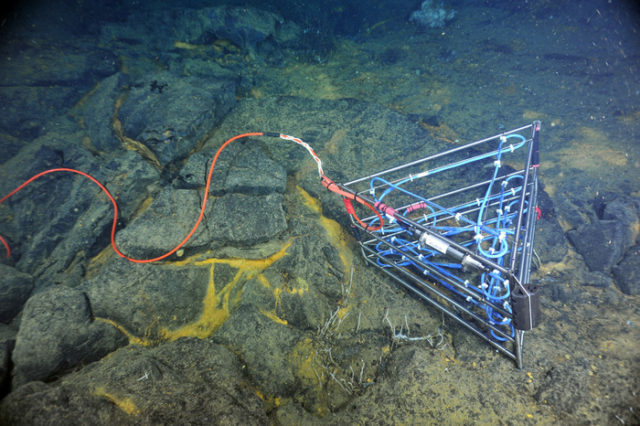 The Diffuse Vent Fluid 3-D Temperature Array measures temperatures of diffuse flow across the seafloor. The thermistor array is designed as 4 stacked triangular arrays with 24 independent temperature measurement points, providing a three-dimensional distribution of temperature. Moderate- to low-temperature hydrothermal fluids exiting diffuse flow sites on Axial Volcano support communities of animals that include limpets, tubeworms, scale worms, clams, and Pycnogonida, an arthropod that resembles a spider. Critical to understanding how these communities thrive, evolve, and expire are long-term measurements of fluid temperature and chemistry, coupled with direct imagery. A custom thermistor array, developed by UW Project Scientist, Giora Proskurowski, is designed to measure the 3-dimensional distribution of temperatures within a diffuse flow site. Within the four layers of blue cable, there are 24 places where temperatures will be continuously measured. 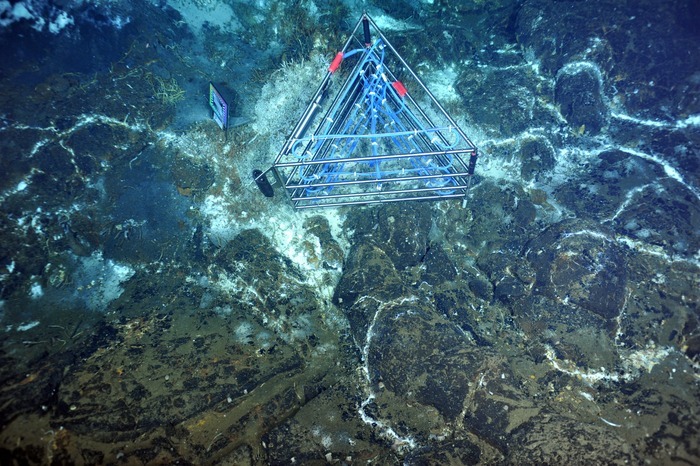 When installed at the base of a hydrothermal chimney within the ASHES hydrothermal field at the summit of Axial Volcano, the cabled thermistor array will provide a real-time 3-dimensional “view” of the temperature structure at this site. Such data will provide information about the environmental conditions within which the biological assemblages thrive and evolve. Other installations at this site include an osmotic sampler, to determine the temporal evolution of fluids, and a high-definition video camera, to study fluid velocities and the evolution of animal and microbial communities within the context of evolving environmental conditions (e.g. earthquakes, lunar tides, eruptions). 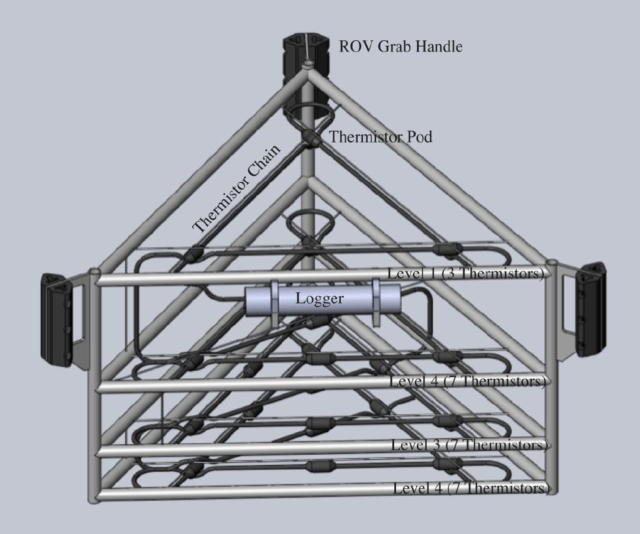 Drawing of the 3D Thermistor Array configuration.